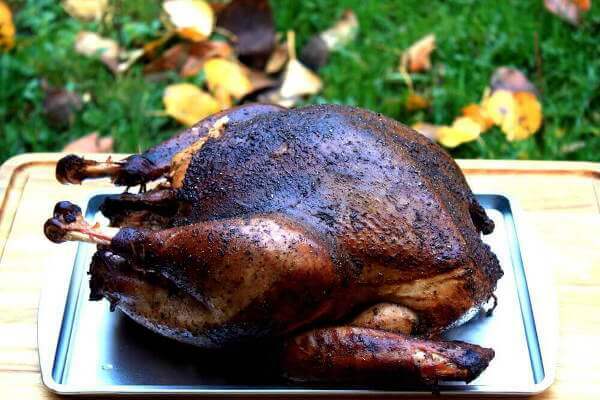 With this succulent smoked turkey brined in apple juice, you get a great flavor and improved texture of your turkey. 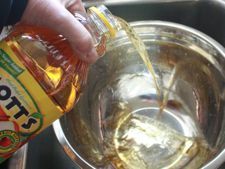 Because of the sweetness of the juice, no additional sugar is added to this recipe. This brine recipe is pretty easy to put together, but requires a bit of preparation before the actual brining of the turkey can begin. Bring the water and salt to a boil. Add the spices to the water and drop to a simmer. After 5 minutes, cover the pan, remove from heat and allow to cool to room temperature. Place the water in the refrigerator and chill overnight. Strain the now chilled water into your brining container and add the apple juice. Place your prepared turkey (rinsed well, excess fat and skin removed, skin pricked) in the apple brine and allow it to soak for 24 hours. Keep the turkey in the fridge as it brines. If there's no room, a milk jug full of frozen water can be placed over the turkey, which will both hold it down and keep the brine cold without diluting it. Remove the turkey from the brine and rinse well. Dry the skin thoroughly by patting dry with a towel. Allow to air dry for 30 minutes before smoking.